“The previous administration talked about energy independence, but wouldn’t drill and transport. It was all talk,” @SecretaryPerry says. The United States is a net energy exporter, the former Texas governor noted, but an old law and the Obama administration’s preference for some energy industries over others prevented the nation from being as strong as necessary. The 1920 Jones Act requires that vessels carrying fuel or other goods in U.S. waters between U.S. ports must be built, registered, owned, and crewed by American citizens. Because it costs more to build and operate ships in the U.S. than in other countries, it can cost as much as three times more to ship oil from the Gulf of Mexico to New England states than it would cost to ship the same amount of oil from Florida to Europe, according to an analysis last month from the American Enterprise Institute. The previous administration talked about energy independence, but they wouldn’t drill and transport. It was all talk. They had a clear message to industries such as fossil fuels and nuclear. We [in the Trump administration] are all of the above. We are not here to pick winners and losers. The market can pick winners and losers. Trump announced a review of U.S. nuclear energy policy; construction of an oil pipeline to Mexico to increase energy exports; negotiations to sell more American natural gas to South Korea; Energy Department approval of two applications to export liquefied natural gas; and creation of an offshore oil and gas leasing program. Perry vowed to expedite the exporting of liquefied natural gas. With hydraulic fracturing, or fracking, the U.S. has become the largest producer of liquefied natural gas in the world, according to the federal Energy Information Administration. It has been up to the Energy Department to approve those exports based on whether they are in the national interest. “If a company meets the rules and standards, we’ll say, ‘Here’s the permit,’” Perry said in the interview. Somehow, it’s not been in the forefront of our energy portfolio, and our supply chain of future nuclear scientists [is] not being developed. We want to get them back, with the acknowledgement they will have the support of their government. 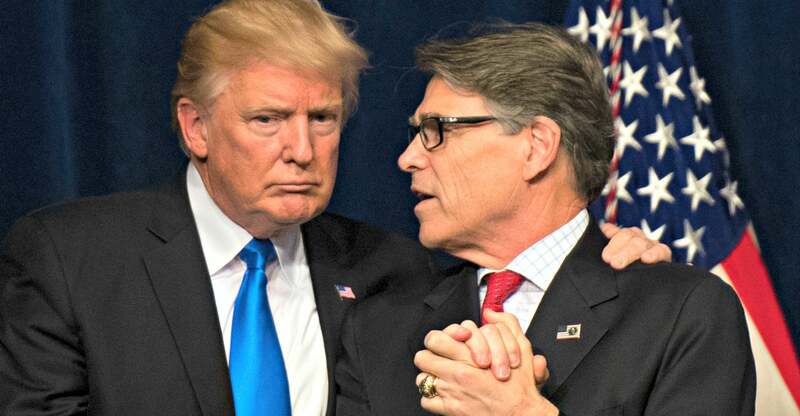 That support won’t come through subsidies, as with green energy projects under President Barack Obama, but a priority for national laboratories to test new nuclear technology, Perry said. Perry cited NuScale Power in Idaho, which is working on a “modular” nuclear reactor, a smaller factory-built model that eliminates many risks of installing and reduces construction costs. Some of the modular reactors could be used to power a single manufacturing facility. Before Trump announced a review of the nation’s nuclear policy last week, media reports raised questions about whether the administration would support NuScale with tax dollars. Overall, Trump’s fiscal 2018 budget proposal would cut the Energy Department’s nuclear energy office by 31 percent, affecting grants to research, including those that have gone to projects such as NuScale’s, The Washington Post reported. Whether it’s “energy independence” or “energy dominance,” clearing regulatory hurdles for American energy will benefit national security, economy, and the environment, Perry said. It also will create U.S. jobs and boost the economies of allies buying the affordable energy. The man who was governor of Texas for 14 years rejects what he calls a “false narrative” that the U.S. can’t tap its natural resources while protecting the environment. Texas led the nation in emission reductions during his time as governor, Perry said. Carbon emissions went down by 20 percent, sulfur dioxide emissions declined by 50 percent, and nitrogen oxide dropped by 60 percent.